Optimum Scouting is here at the East-West Shrine Game practices, with our scouting staff evaluating players at every position every day. Our winners from Day 1 are North Dakota State QB Easton Stick, Virginia RB Jordan Ellis, Nebraska RB Devine Ozigbo, Fresno State WR KeeSean Johnson, Georgia WR Terry Godwin, San Diego State OT Ryan Pope, Morgan State OG Josh Miles, Sam Houston State DE Derick Roberson, and Wisconsin SAF D'Cota Dixon. -Entering the week of practice, Easton Stick of North Dakota State was the best quarterback in attendance, and he lived up to it on Day 1. While the practice session wasn't designed to maximize the quarterback play on the West squad, Stick still showed the poise, decisiveness, and tight spin and placement that his film shows. He'll have a chance to thrive this week, but his poise and comparability to his film is obvious. -Boise State's Brett Rypien looked as reliable as a pocket passer as he did on film, and he picked up the scheme/timing/coaching dynamics as quick as I can remember an all-star game quarterback adapting. 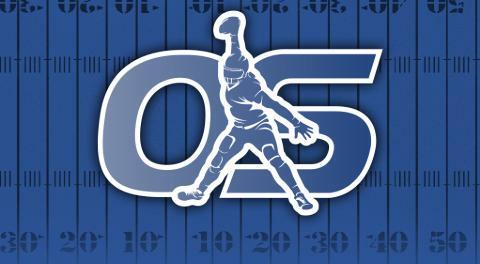 He showed great timing and rhythm in drops and progressions, and is proving even early here he's a reliable quarterback. -Jordan Ta'amu of Ole Miss looked at his best when targeting his teammate DeMarkus Lodge, but overall his arm talent and tight spin wasn't there early today. He shows great decisiveness on mid-field throws and clearly has the confidence and composure desired, as he shows at times on film, but the ball flutter and missed throws on the perimeter will need to be cleaned up. Still, he's one of the best quarterbacks here. -One of the stars of a run-heavy East practice was Virginia running back Jordan Ellis. A tough between the tackle runner with plus contact balance and burst when he has a seem, Ellis made the rare great first impression in an all-star game setting, especially without full pads. While he'll have a lot still to prove as a runner, especially in pass catching and pass blocking drills, but he looks like one of the most explosive runners here. -Nebraska's Devine Ozigbo is the best running back athlete here, and he's started to show it already, playing with high-end burst on inside runs and showing off his explosiveness and recovery laterally and in contact a lot despite it not being full contact. We'll see if he can continue to show full explosiveness when everyone can hit, and Ozigbo's biggest evaluation may come during the game on Saturday. -Purdue's Terry Wright is one of the smaller receivers at the game but plays consistently big in the middle of the field. With high-end speed and reaching his top speed quickly, Wright catches and works upfield at a remarkably high level, finishing openings in defenses with soft hands and a controlled lower half. He'll likely earn a heavier workload as more quarterbacks than just his former teammate David Blough starts to really get comfortable with him. -Ole Miss's DeMarkus Lodge entered the week as arguably the best receiver at the event, and he didn't disappoint today. His quarterback Jordan Ta'amu gave him some chances to shine as he threw to Lodge on the perimeter away from his frame and in traffic, where Lodge thrives. A physical, willing to make contact receiver, Lodge showcased his physicality throughout Day 1 and will look to show more of that big play ability during practice all week. 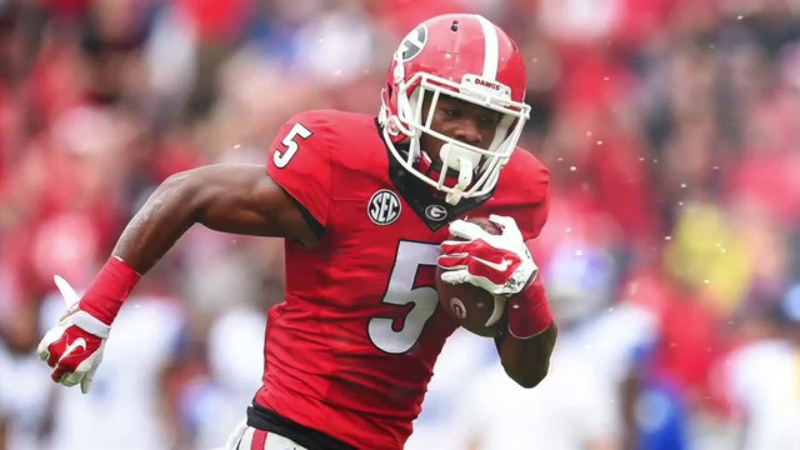 -Terry Godwin of Georgia is the fastest receiver at the Shrine Game, and if he can continue to show extension away from his frame in the mid-field and immediate body control after catch on inside routes, he may secure a top-five round draft pick. With potential 4.4 or faster speed, Godwin has already exceeded my expectations of his fringe draftable grade. -KeeSean Johnson of Fresno State was one of my favorite receivers to watch during my Shrine Game preparation and carried draftable grades from our staff, and thus far has been the most impressive West roster receiver in attendance. He plays with very decisive footwork and change of direction, and is consistently in position to work outside of his frame and create a wide throwing window for his quarterback. He, along with Shawn Poindexter of Arizona were the two more impressive receivers for the West. -FCS standout Olisaemeka Udoh from Elon got tons of reps at both tackle and guard for the East team where he showed off his length and raw power. Teams will view him as a project at guard while he continues to adjust to the talent level. -Miami tackle Tyree St. Louis set the tone for the whole offensive line unit with his physicality and vocal leadership. St. Louis dominated team period clearing lanes on play side runs and protecting his quarterbacks from both tackle positions. -Kentucky center Bunchy Stallings was the star of 1 on 1’s winning nearly every matchup against a deep East defensive line. Stallings moved extremely well while deploying his trademark bulldozer style of tough run blocking and played much better than anticipated in pass protection. -Lamont Gaillard had an equally impressive day but plays with a very different style than Stallings. Gaillard is tremendously agile and moves decisively to the next level where he clears the second level with ease. Gaillard was making textbook zone blocks on the move all day using lateral mobility and body control. -The surprise of the day was Joshua Miles from Morgan State who was relentless through every rep of practice. From the left guard position, Miles was consistently winning his matchups with fluid athleticism and strong anchor. -Arkansas’ Brian Wallace also had a very strong first day moving back and forth from right guard and right tackle. Wallace was especially impressive in pass protection where he was able to use his prototypical length to great effect, shutting down the faster speed rushers. -Syracuse defensive tackle Chris Slayton stole the show early cruising while making sure his teammates were both exerting themselves, and appreciated for good reps. Slayton looked all of 6’4” 310 lbs and showed tons of instinct in team periods. He’ll be a fun one to watch once the full pads come on. -Texas defentive tackle Chris Nelson flashed extremely high upside as a playmaker and run defender, controlling the line of scrimmage and shooting gaps with great pursuit and closing speed. His instincts for making tackles and disrupting run plays was above the level showed in this year’s film and is an exciting interior defender to watch this week. -Derick Roberson was the small school standout from the West team roster with his extremely active hands and sharp footwork. The Sam Houston State defender is more than athletic enough to fit multiple schemes, showing burst and quickness from two and three point stances. He and Durham have shown the best bend and flexibility and will be a lethal combo for the West team. -Mississippi State's Jamal Peters was one of the more intriguing defensive players in attendance this week simply because he didn't show the promise his measurables and early career film said he might reach. Through one day, he's already showing why he may be a better pro than college player, disrupting interior routes and using his hands and length to run in stride vertically in coverage. I'll look for him to have a big week down in St. Pete. -Tulane's Donnie Lewis has earned strong reviews from NFL scouts, enough that I wouldn't be surprised if he earns a Senior Bowl call-up if there's an injury. He played well today, but he carries himself and has the bend and decisive steps of an NFL cornerback, outside or inside, and should test these West quarterbacks (Stick and Rypien most notably) all week long. -Wisconsin safety D'Cota Dixon had an interception today, reacting well to a downfield route and staying in position, high pointing and finishing the opportunity. He had another pass breakup later in practice, and has looked arguably the most comfortable of any defensive back on the West roster in his drops and vision of the quarterback in the defense thus far. -I didn't notice him too much during practice, but James Madison's Jimmy Moreland had two outstanding coverage reps, one against Terry Wright in a drag route where he was in position far longer than I'd expect a Shrine Game cornerback to be, and another where he pressed DeMarkus Lodge off the line and controlled him, ran in stride without over contact, and was in perfect position if the quarterback threw his way. He beat two of the best receivers here with the skill set their best at. He has strong film, and it was a good first day.